There is a vast array of greenhouse equipment to tempt the unwary gardener. The following list includes some of the more useful items designed to make raising of tropical plants in a greenhouse easier. All these items also make ideal Christmas/birthday gifts for the keen gardener. Paraffin heaters are the most basic form of greenhouse heater. They consist of a reservoir and wick in varying degrees of sophistication. The paraffin heaters will heat up a greenhouse but with several drawbacks. You need to light and extinguish them. This requires constant attention to weather forecasts. A regular eye needs to be kept on the reservoir so it does not run dry at the most critical moment. Gas heaters are more sophisticated. They can be thermostatically controlled. They can be fed by either bottle or mains depending on the model. However the expense of getting mains gas to a greenhouse must be significantly higher than electricity. The main draw back is still that you are vulnerable to running out of gas. Gas cylinders take up valuable space in the greenhouse. Electric heaters are the simplest to use but as the name implies require an electrical supply. Electric heaters can be purchased inexpensively but they are often subject to failure in the fan bearings and as such become noisy in use. More expensive heaters incorporate better fans technology resulting in better heat distribution. Electric fan heaters can easily be controlled by thermostat. They are unlikely to run out of fuel if installed competently and in the summer they can be used to circulate air around your plants. Tubular electric heaters just don't have to umph to deal with an Arctic air stream that occasionally hit during the winter. Although not strictly "greenhouse equipment" electricity really does make life easier in the greenhouse. Current regulations (in Britain) state that you can no longer simply run a bit of flex from a kitchen socket to the greenhouse. The need for a qualified electrician who will install a water proof circuit in your greenhouse does push the price up a bit but is worth it. Before calling the electrician work out how much of the equipment mentioned here you think you will need then allow for a couple of extra sockets just in case. As with most lighting you have the choice between low energy bulbs/strip lights and the hungrier tungsten or halogen lights. The decision on which type of lighting you chose depends somewhat upon what you intend to be doing in the greenhouse at night. If you plan to do a lot of work in the evenings then fluorescent lighting is probably the best choice. The location of lights in a greenhouse is invariably in the roof. Fluorescent lighting casts a much more gentle shadow so it will be much easier to see what you are doing. They also have the usual benefits of low running costs and long life span. If your evening visits to the greenhouse tend to be more voyeuristic in nature then halogen lights may be a better choice. These bulbs do have relatively high running costs for the light they throw out but they give a cleaner light, illuminating your plants more dramatically. Halogen bulbs also have the benefit of a long life span. Tungsten (normal) light bulbs blow most frequently. As they should be fitted in a moisture proof housing they will require the most maintenance. Opening some fiddly moisture-proof housing in the dark, is something you probably wish to do infrequently. Germinating seeds that require a hot and humid environment. If you do not have the space for heated propagation mats they are also useful for small scale production of tuberous and rhizomatous plants. Probably the most useful piece of greenhouse equipment for kick starting your tropical plants into growth. Heated propagation mats are also extremely good at mending a faulty plant. A spell on a heated mat will usually re-invigorate it. They are the sort of WD40 of the propagating world. The propagation mats are fairly basic pieces of equipment, consisting of a sheet of matting with a heated cable running through it. The whole thing is placed on a polystyrene base to insulate the base. 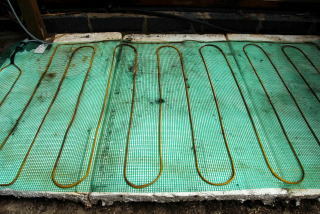 These are also referred to as seedling heat mats. (A good source of free polystyrene is your local fishmonger, the lids from salmon boxes are particularly good). Aluminium foil is then secured over the top for more even heat distribution. Your plant pots are then placed on top of the foil sheeting. The temperature is controlled by a thermostatic probe pushed into the compost of one of the pots. The beauty of propagation mats is that they allow you much greater control over what comes into growth and when. Automatic greenhouse vents are another piece of greenhouse equipment designed to make your life easier. 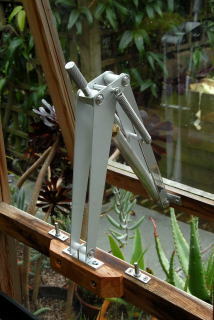 The beauty of these is that they allow for, as the name implies, automatic venting of the greenhouse. The principle is very simple. A piston is filled with a wax that expands in the heat, opening the windows and shrinks again in cooler weather closing the windows. Having set off somewhere on a cloudy day and then the sun comes out. Having set off somewhere on sunny day and it suddenly gets very cold. Lying in bed at night wondering if you left the windows open and are heating the night sky. The system works best if you have a minimum of two automatic greenhouse vents. One in the roof and one in the side. The roof one will allow hot air out and the side vent, the cool air in. If these two openings are at opposite ends of the greenhouse it will allow for the greatest circulation of air. Greenhouse benches allow you to increase the available floor space within the greenhouse. Growing plants on top of the benches allows you to place elements of greenhouse equipment such as heated propagators and propagation mats beneath. In the initial stages of growth on a propagation mat, light is not essential. Once the plants are in growth they can be moved off the mats into a brighter position. 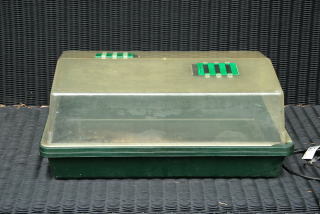 This is also the case with heated propagators as well. If you are taking cuttings it is unwise to have the propagators in full sun. This will lead to conditions that are far form ideal for cuttings. Growing plants on top of benches tends provides them with better light than if grown on the floor and provides better air circulation. Plants grown on top of benches are also less likely to be trodden on, particularly in the case of seeds trays. Try to keep any benches level so that plants watered in trays get equal access to he water. Watering cans. A large one for bananas and the like. A smaller one for more delicate operations. Kitchen scissors. These are often more versatile in the greenhouse than secateurs. Soft paint brushes for removing aphids. A moisture meter is useful for checking moisture levels during the winter. A fly swat for dissuading queen wasps from taking up residence. A maximum /minimum thermometer to check your night time temperatures and adjust heater thermostats accordingly. A sharp knife for minor horticultural surgery - preparing cuttings etc. A pair of long tweezers for removing debris from small spiky plants. The potting tray is very useful for a number of tasks, particularly minimising mess. For instance, all evidence that you were actually pricking out and potting on seedlings on the kitchen table can quickly be removed. Pots and seeds trays are best stood inside plastic 'gravel' trays. Gravel trays are like seed trays but without any holes. They come in various sizes. To keep things simple just two sizes are required. 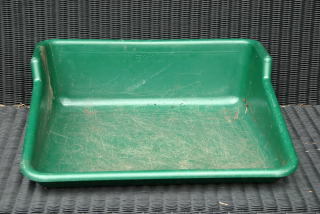 Standard gravel trays are ideal for standing seed trays in. Young plants that are growing in 3-4 inch pots are also ideally suited to this size tray. The content of a small watering can (700ml) is the perfect volume of water to satisfy all the plants growing in a small gravel tray. For best results the water is poured directly into the tray. This allows the pots absorb the water from below. Larger plants in 2lt+ pots are better placed in 'Jumbo' trays designed for grow bags. These larger plants can be watered directly and left to sit in a small amount of water when actively growing. Once upon a time when breakfast TV was entertaining, there was a segment of a programme dedicated to people with obsessions. On this particular day a young man was featured who happened to be the British junior leak-growing champion and hailed from Yorkshire or thereabouts. In between the narcissistic guffaws of the presenters, the young man could be heard to say 'Warm water, use warm water'. The moral of this tale is to use warm water when watering your fledgling tropical plants. Just because it is nice and warm in a greenhouse, the water coming out of the garden tap can still be extremely cold in the spring. Dousing your tropical plants with icy water is not the best way to earn their loyalty. If you don't have electricity in your greenhouse the problem can be alleviated somewhat by standing filled watering cans on the greenhouse floor. The water should be a few degrees warmer than straight out of the tap. If you do have an electrical supply to your greenhouse, a 25 litre beer fermenting barrel with tap and an aquarium heater should provide you with your daily needs of warm water. Always remember when using this method, to re-fill the barrel after each time you use it. Also never completely empty the barrel, an aquarium heater will shatter if allowed to dry out whilst on.